The number of speeding fines issued in Oxfordshire more than doubled in the first month cameras were turned back on after being off for eight months. Funding was withdrawn for 72 cameras and 89 mobile sites last August as part of budget cuts but they were reinstated on 1 April. The numbers of drivers caught in July 2010 was 2,286, while the figure for April 2011 was 5,917. The figures were obtained by BBC Oxford from Thames Valley Police. They showed about 200 people a day were being caught speeding in the county since the cameras were turned back on. Sgt Chris Appleby, of Thames Valley Police roads policing department, said: "It is disappointing to see the rise in the number of drivers caught speeding by the cameras since they were reactivated. "The rise in numbers could be attributed to the fact motorists had become complacent since the cameras were switched off and did not keep their speed in check. "This shows that the cameras, and other road safety measures such as road safety checks and speed awareness courses, are necessary to keep speed down and make the roads of Thames Valley safer for all our communities." Andrew Howard, head of road safety at the AA, said the cameras should not have been switched off in the first place, suggesting that switching off some but not all cameras was a more effective deterrent. "It's hard to infer much from these figures as we don't know which cameras at which sites were used - there isn't a camera in every box," he said. Mr Howard said if more cameras were used the figures would appear higher, adding: "It's a good way to come back with a bang." Police said during the months the cameras were switched off deaths and serious injuries on roads had increased across the county but accidents away from fixed cameras fell slightly. The cameras were switched off after funding was withdrawn by Oxfordshire County Council following government cuts to the authority's road safety grant. It had to save £600,000 from its road safety budget - money which would have been given to the Thames Valley Road Safety Partnership. 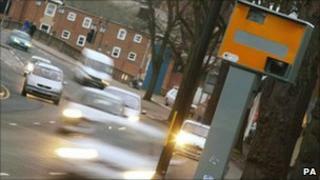 The cameras are now paid for by speed awareness courses and backroom savings, police said.